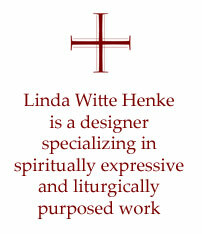 Linda Witte Henke is a designer/artist specializing in the creation of work for use in liturgical settings. Linda's sources of inspiration include sacred texts, hymns, and the theological reflections and insights that emerge on the course of her own faith journey. Her designs are informed by academic degrees in journalism and theology, extensive studies in art and surface design, and experience as a parish pastor and published author. For many years, Linda's art practice was focused on commissioned projects for churches and religious agencies. While that work was gratifying, the costliness of the materials used and the labor intensity of the processes employed in creating those projects meant that her work was available only to organizations with substantial financial resources. More recently, Linda suspended her commission practice in order to focus on the creation of digital designs that she makes available as print-on-demand fabrics for purchasers to use to in creating banners (now), as well as paraments and vestments (in the future). The affordable price point for these fabrics makes Linda's work accessible to parishes and congregations of many sizes and contexts. She feels privileged to now have opportunities to collaborate with a wide variety of faith communities in creating quality liturgical art, like the above banners, for their places of worship.